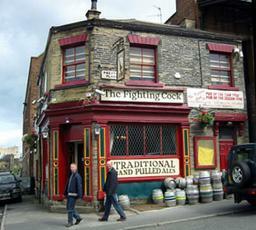 Probably the best ale pub in Bradford but it is a bit of a trek out from town in a pretty desolate area. It is your typical bare boards, wooden seats establishment though minus the flat hat and whippets. The TFC reminds me of an excellent pub I visited in the 1980s called the Bradfordian---in fact it may be one and the same place. A basic, classic traditional heritage pub with 8 handpumps (or was it 10?---I stopped counting). Not to be missed! I went in here for the first time on 27/2/13 and i was impressed by the various real ales that the pub served. I went in approx 3.30pm and left around 8.00pm even though i was only calling in for a couple of pints. It had been recommended to me by my partner who had been a regular customer in the 1980's and 90's. I would highly recommend this pub to anybody. This pub should be demolished immediately - and rebuilt at the bottom of my road. Quite simply the best old-fashioned, backstreet boozer I've visited in a long time.